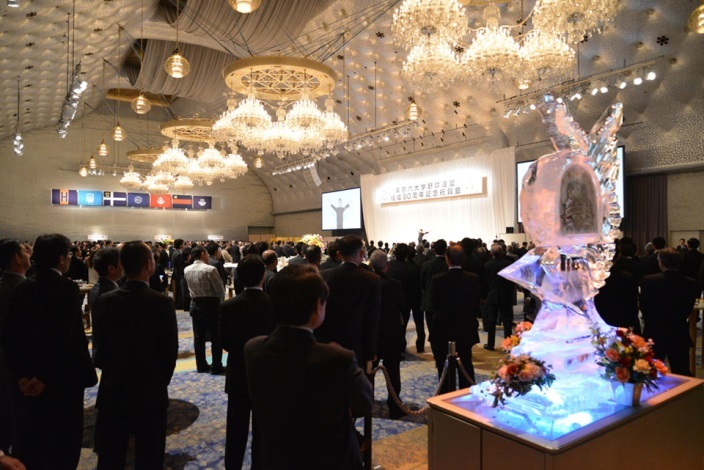 1,500 alumni, friends and family of the Tokyo Big6 Baseball League (Tokyo Big6) gathered at Grand Prince Hotel New Takanawa in Tokyo on Sunday, December 6 afternoon to celebrate the League’s 90th anniversary. The festivities commenced with several congratulatory speeches by the leaders of baseball community in Japan including Dr. Eiji Hatta, President of Student Baseball Association and High School Baseball Federation, Norio Ichino, President of Baseball Federation of Japan (Graduate of Waseda Univ. a member of Big6) as well as Katsuhiko Kumazaki, President of Nippon Professional Baseball (Graduate of Meiji University, a member of Big6). 6　prominent figures such as Yoshinobu Takahashi (Keio Univ. and new skipper of Tokyo Yomiuri Giants), Tsuyoshi Wada (Waseda Univ., SoftBank Hawks, ex. MLB) and Sen-ichi Hoshino (Meiji Univ. Rakuten Eagles) joined a talk show moderated by Kensuke Ohgoshi (ex. Univ. of Tokyo’s pitcher, leading TV anchor of NHK). Legend Shigeo Nagashima (Rikkio Univ., Tokyo Yomiuri Giants) , Koji Yamamoto and Koichi Tabuchi (both Hosei Univ., and Hiroshima Carp and Hanshin Tigers respectively) looked back their amazing experiences during college days at the individual interviews after the talk show. The 3-hour party concluded with big chorus of school songs, led by cheer leders (photo) accompanied by the Big6 all star band. Tokyo Big6 is an intercollegiate baseball league that features six prominent universities in the Tokyo area: Hosei Univ., University of Tokyo, Rikkio Univ., Waseda Univ., Keio Univ. and Meiji Univ. All of their official games are played at Meiji Jingu Baseball Stadium in two seasons, Spring and Autumn.